This little bitty was made for my cousin's newest baby, Dominic, hence "Doms". It was made using the crumb technique, where you use crumbs/pieces of scrap all pieced together, with an awesome effect! I wanted the crumbs to all be blue and decided to set the crumbs on point. I used all quilt shop quality fabrics, but didn't necessarily know what designers there were, as it was a grab bag type of quilt, hence 'crumbs'. 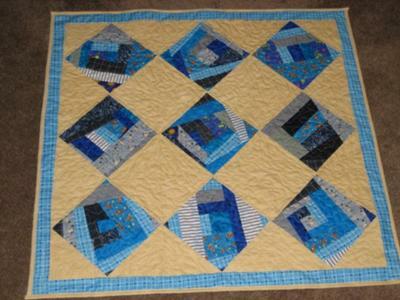 This baby quilt measures approx 45 inches square. Quilted by machine. Warm n Natural batting. Wish I could show the unique label. I took a picture of one of the crumbs with a lighter center, cropped that, added Dominic's name and stats. Then fused it onto the back. Very special, just for him, a special boy indeed.